One Christmas Colt's boss had given us a box of cookies from a local bakery called the Breadfarm, and it contained a delicious assortment of cookies including Orange Cranberry Shortbread Cookies. So once we ran out of cookies I had to recreate them with the addition of pistachio's. 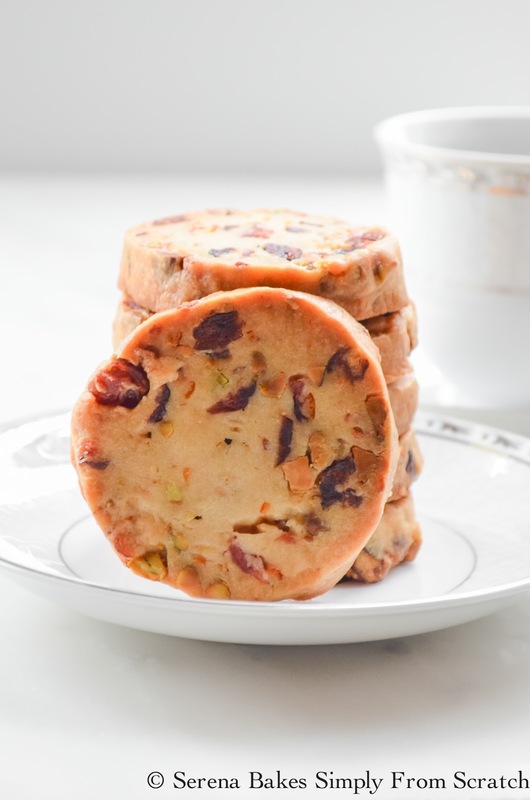 Orange Cranberry Pistachio Shortbread Cookies have the perfect balance of butter, orange zest, cranberries, and pistachios. They are tender and melt in your mouth with a lovely flavor. I love that the dough can be made a few days ahead of time so you can pull out and slice enough to enjoy each day, but they also store wonderfully in an airtight container, making them great for gift giving, and cookie trays. The Breadfarm rolls the edges in a coarse sanding sugar for a little extra decorative touch, but we didn't miss the extra sugar flavor wise. First remove the zest from 1-2 large Oranges. 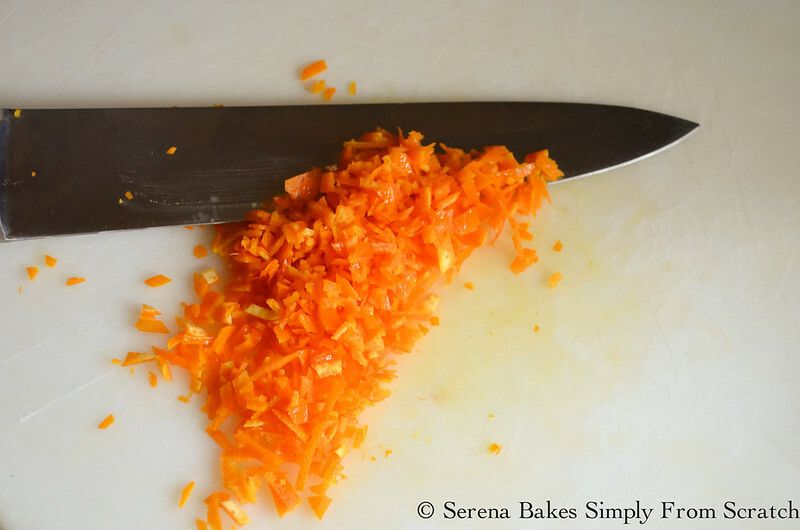 I like using a vegetable peeler and then scraping any excess white pith off the zest with a sharp knife. 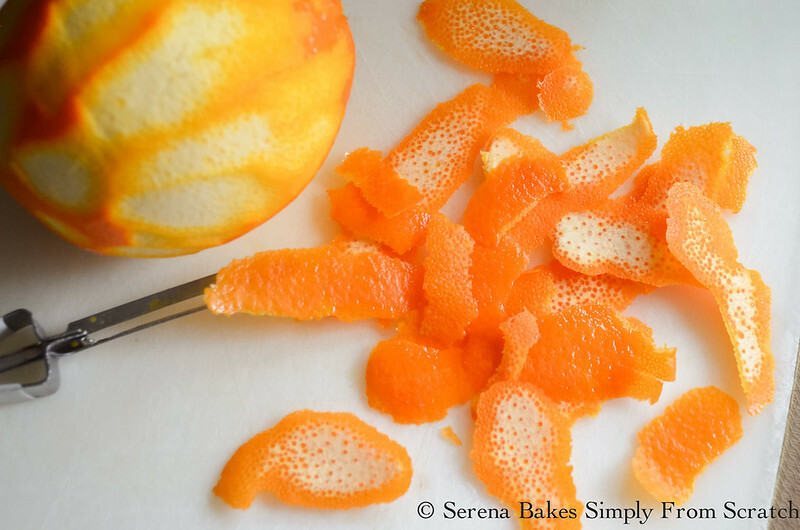 This allows a little bit larger pieces of Orange Zest then using a zester. 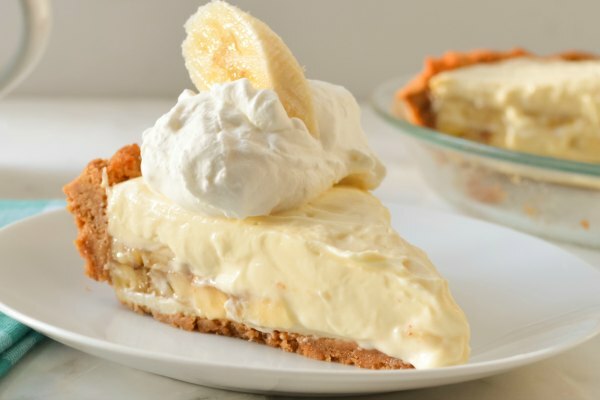 Cream together 1 cup Butter, 3/4 cup Powdered Sugar, 2 tablespoons Orange Zest, 1 teaspoon Pure Vanilla Extract, and 1/4 teaspoon Sea Salt, until well combined. Add 3/4 cup Dried Cranberries and 3/4 cup Pistachios, and mix until well combined. 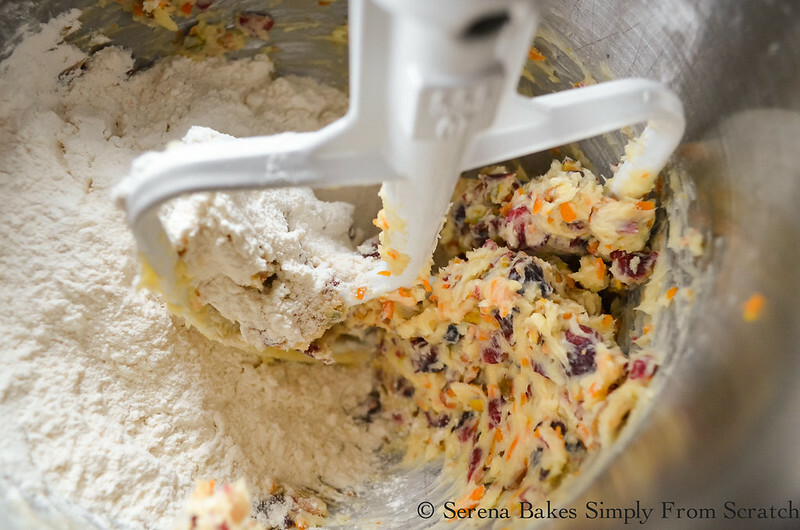 Stir in 2 cups Fluffed All-Purpose Flour just until combined, being careful not to over mix. Since there's no eggs you can totally taste the dough, if that's your thing. Divide dough into 2. Shape into 2 logs 2"-2 1/4" thick and wrap in plastic wrap. 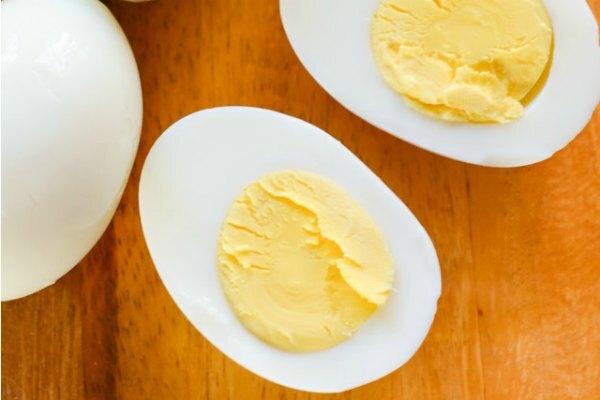 Refrigerate for 1 hour or up to 3 days. 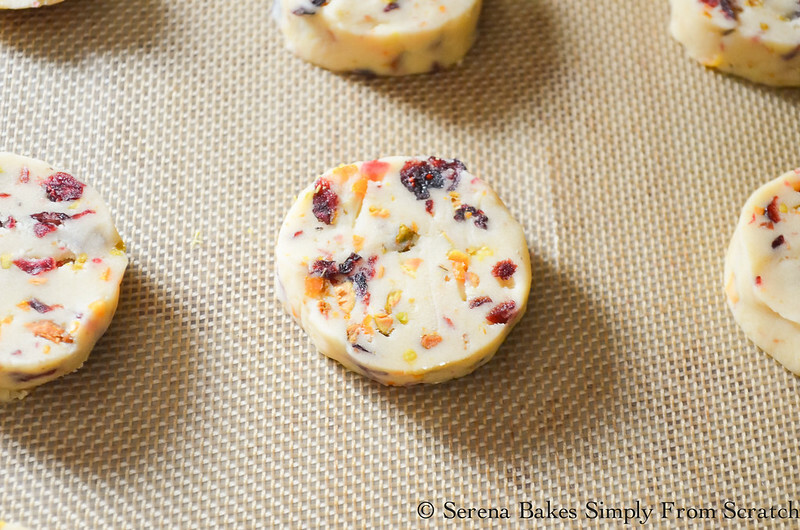 Slice Orange Cranberry Pistachio Shortbread Cookies 1/4" thick and place on a silpat or parchment lined cookie sheet. Bake cookies in a 350 degree oven for 16-18 minutes until edges are just lightly brown. Allow cookies to cool on baking sheet to ensure centers are well cooked and crispy. 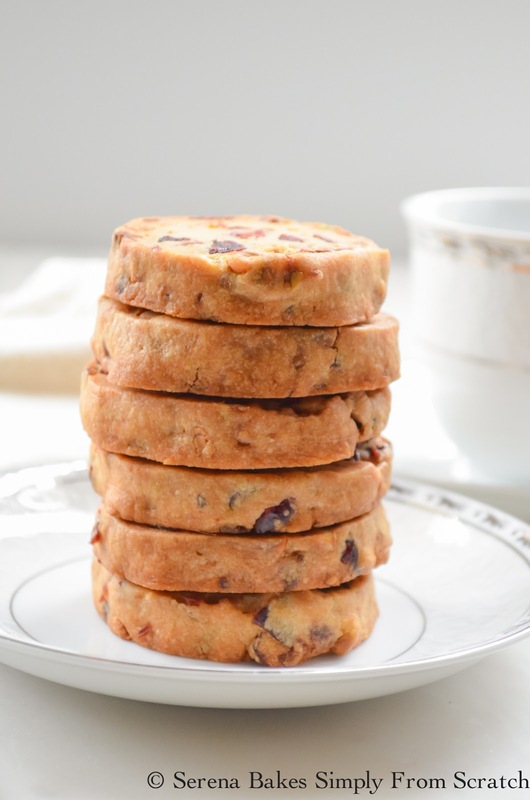 Orange Cranberry Pistachio Shortbread Cookies are wonderful with a cuppa coffee or tea with friends, holiday cookie trays, or just a fun new cookie for Santa! 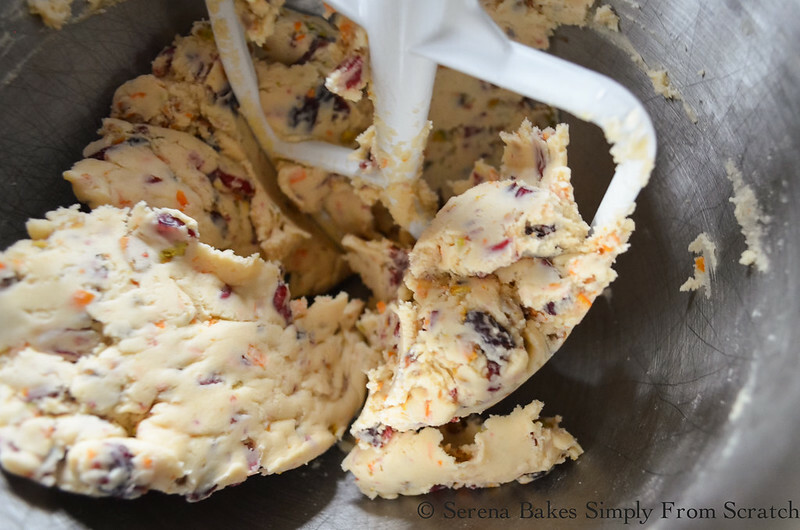 Orange Cranberry Pistachios Shortbread Cookies from Serena Bakes Simply From Scratch are a wonderful holiday cookie perfect with a cup of coffee or tea. 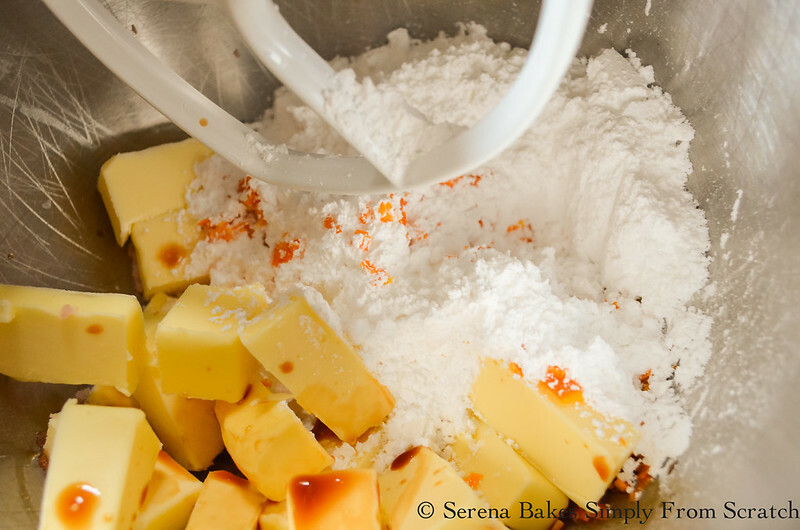 Cream together butter, powdered sugar, orange zest, vanilla, and salt, until well combined. 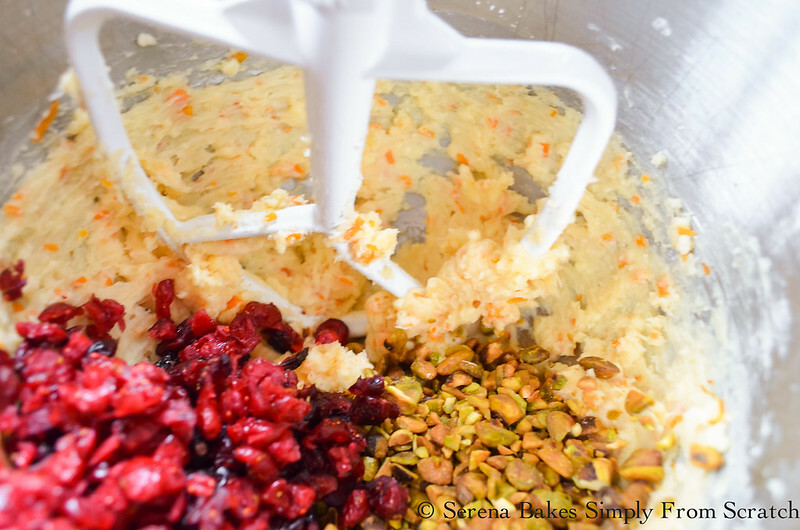 Add cranberries, and pistachios, mix until well combined. Add flour, stir just until combined being careful not to over mix. Divide dough into 2. Shape each half into a 2 - 2 1/4 inch wide log, and wrap in plastic wrap or parchment. 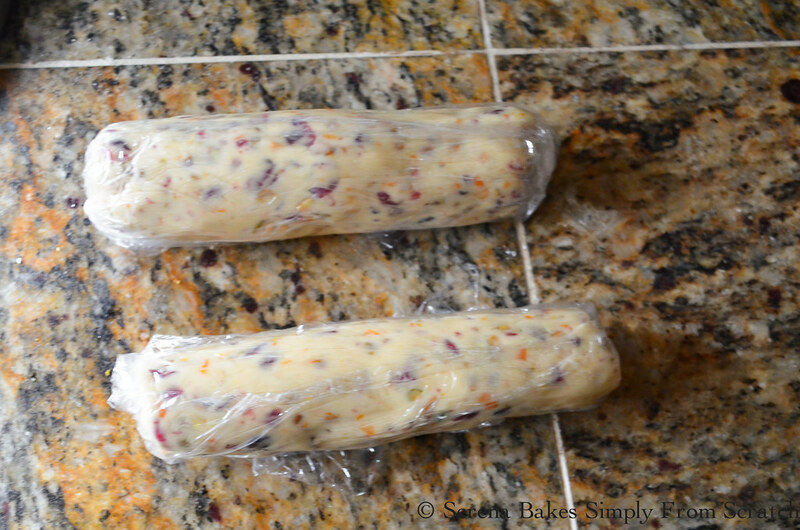 Refrigerate for 1 hour, or up to 3 days. Preheat oven to 350 degrees. Line cookie sheet with silpat, or parchment paper. Slice cookies 1/4 inch thick. Place 2 inches apart on cookie sheet. Bake cookies for 16-18 minutes until edges are lightly browned. Allow cookies to cool on cookie sheets to ensure centers are cooked through. Store cookies in a airtight container. I love these kinds of log cookies! So wonderfully easy. And the flavors you have here are awesome! Yum! I love a good shortbread cookie, and these look fantastic! 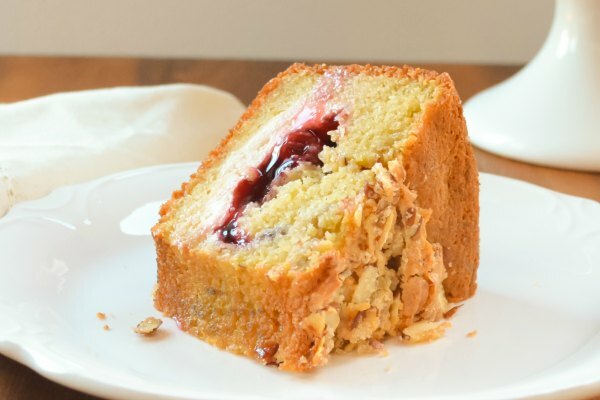 The addition of pistachio is a great twist on the classic orange cranberry flavor combo. I also never considered doing the orange zest the way you described - I'll have to give it a try sometime! I can see the intensity of the flavors you created. I have wanted to bake cookies after rolling into a log but I have not. You are inspiring me. The moment I saw the recipe, I new I was going to love it. But on the other hand, I didn't know how pistachios taste in a cookie. Anyway I made them yesterday. They were wonderful !! (This comes from a chocoholic). Put them all together and THESE BISCUITS ARE AWESOME!! I made them today for Christmas and although I don’t usually eat biscuits, I reckon could eat these every day. By far the best homemade biscuits I’ve ever baked or tasted (sorry, Mum). Munch, munch!